During the past 12 months this website has received a total of 19,925 visitors. During the quarter Jan 2019 to Mar 2019, we received 4,444 visitors specifically looking for karaoke hire services. We continue to secure additional page 1 positions in the major search engines for the most popular keywords used by people searching for karaoke hire services. 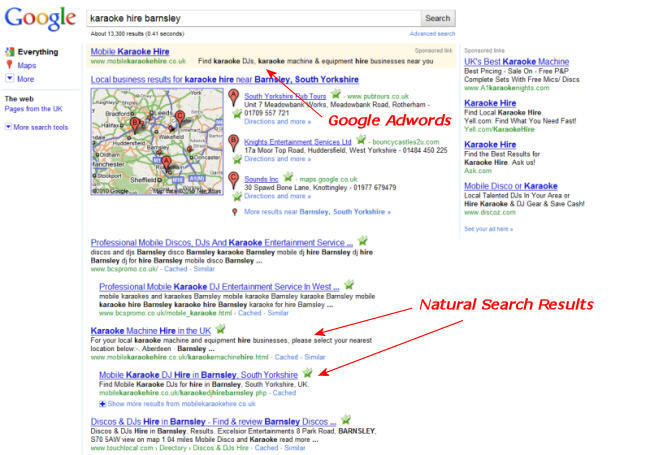 In most cases, Google, Bing and Yahoo now list us in the top few places of their natural search results. In addition, our paid Google Adwords advertising campaign often lists us right at the top of search results. Why not search for karaoke hire in your areas of coverage on Google, Yahoo and Bing and see if we're on Page 1? If we are, we can definitely help your business! If you have reviews of your services online, either on your own or 3rd party website, you can indicate this to our visitors via the Reviews indicator showing on all listings. You can also directly link the indicator to your reviews page. To make use of this feature, simply update your details and in the "Reviews Available Online' field, enter 'Yes' and in the "Reviews Link URL" field enter the full web address for your reviews page. For those businesses covering 5 areas or more, our Unlimited Coverage options are ideal. Upgrade unlimited areas to Silver listings for a total cost of just £5 per month! Upgrade unlimited areas to Gold listings for a total cost of just £15 per month! These options represent amazing value and opportunity for your business. Just one typical karaoke job would pay for unlimited Silver listings for over 2 years! Just one typical karaoke job would pay for unlimited Gold listings for over 9 months! To take advantage of these options, simply update your details and select Silver or Gold listings in all your areas of coverage. If you submit 5 or more areas, we will issue you with the appropriate payment link for the Unlimited Coverage option. County pages automatically include all businesses listed in any of the towns within the county. You don't need to do anything to be included on these pages. May we take this opportunity to thank those members who have taken the time to provide us with valuable feedback regarding our site. It is very satisfying to know that we are making a difference to your business. You will find testimonials towards the top of our Advertiser's page. We know from analysiing our site performance and from speaking with some of our members that many enquiries are being generated by our site and being converted by our members into paying customers. This is fantastic news and confirms our commitment to providing the most cost-effective online advertising for karaoke hire businesses in the UK. We will continue developing and marketing this directory on your behalf to get your business in front of as many potential customers as possible. Don't forget you can quickly and easily update your listing details by simply logging in on the Login page using your business name and password and making any desired amendments. All amendments are still manually checked before going live to ensure quality and consistency across< the site. You will receive an email from us when your amendments go live. A percentage of all advertising revenues from upgraded listings is allocated to Google Adwords advertising. Google Adwords is a very effective means of driving even more highly targetted customers to our listed businesses. It is proving to be very effective and often places us right at the top of the Google results while funds remain. The more businesses that upgrade to Silver or Gold listings, the more customers we will drive to the site via Google Adwords, it's as simple as that. Upgraded businesses benefit directly from this as their listings are prominent and contacted first by our visitors. Please take a moment to check your details are up-to-date in your listings. To check your details and make any amendments please login here. Options to improve the positioning of your listing can be found on our advertisers page. Thanks again for continuing to advertise with us and we look forward to continuing to develop this website and growing our visitor numbers to help you get more business. If you have any questions regarding our website or suggestions for its development, please drop us an email. We always enjoy hearing from our members!